If you just casually glance around Buenos Aires, all you’ll see are porteños, some native South Americans, and maybe some asian people, maybe. Diversity here, race or cultural, isn’t staring you in the face. Honestly, it was one of the biggest changes for Jesse and me. Living in NYC, you walk down the street or ride the subway and you may hear 3 or 4 different languages spoken, and nobody really cares because that’s so common place. But here, for the most part, the population is fairly homogenous. However, if you move out of Palermo, do a little detective work, and look below the surface of the city a little, you’ll find a few immigrant populations, some of whom who have even brought their recipe books with them and opened up shop. 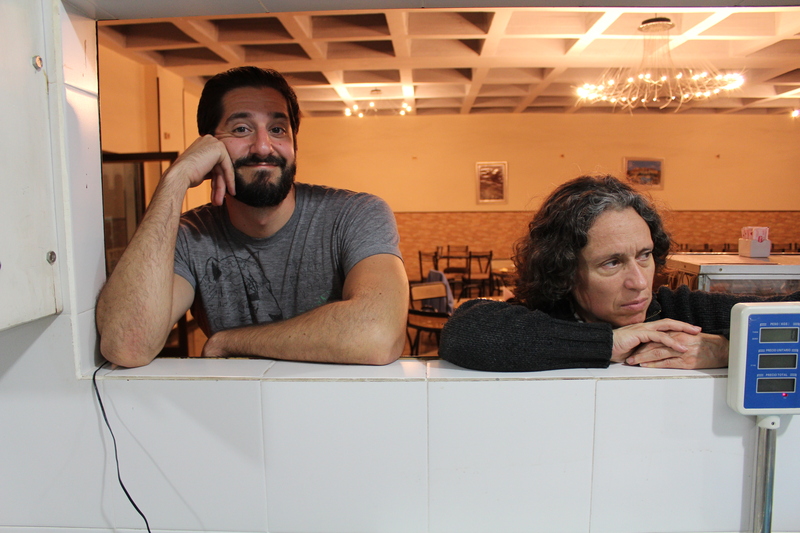 Jesse’s spanish teacher, Gabriela, recently uncovered a wonderful place with delicious Syrian food. She randomly met this woman, Raja (but I don’t know if that’s how you spell her name) at a shop and, being Gabriela, got to talking with her. 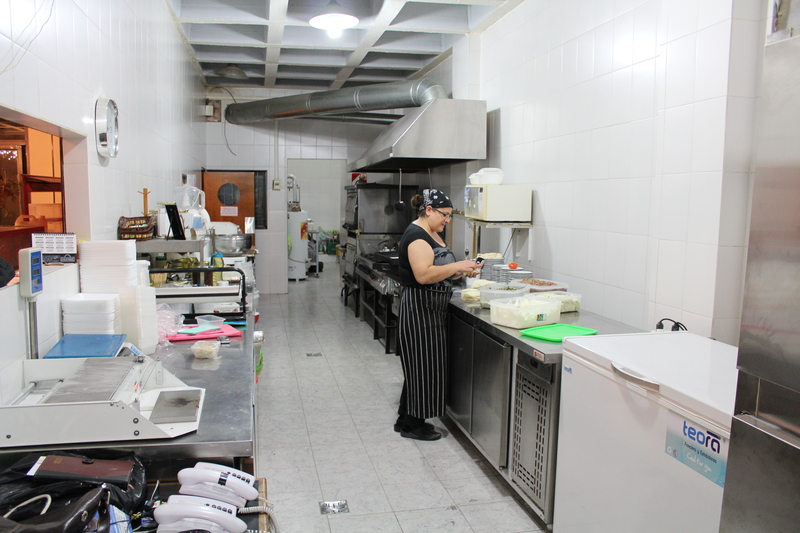 It turned out the woman owned a Syrian catering business that she also ran as an informal restaurant on some nights. You call one or two nights ahead of time, ask her if you can come for dinner, and, if yes, figure out a good time. 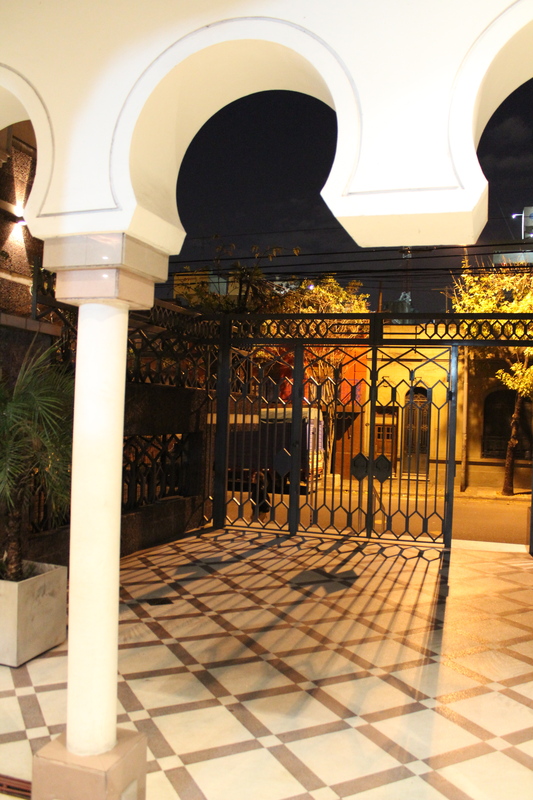 The catering hall/restaurant is located in the San Cristobal barrio of the city and is attached to a mosque with some beautiful architecture. She’s Catholic, but she said she gets a great price for it and it has a nice kitchen. But it also means she can’t serve any alcohol, which annoys her but really isn’t that big of a deal. We were the only ones there that night, which I imagine is typically the case. While we were there, she was preparing for a birthday party the following day. 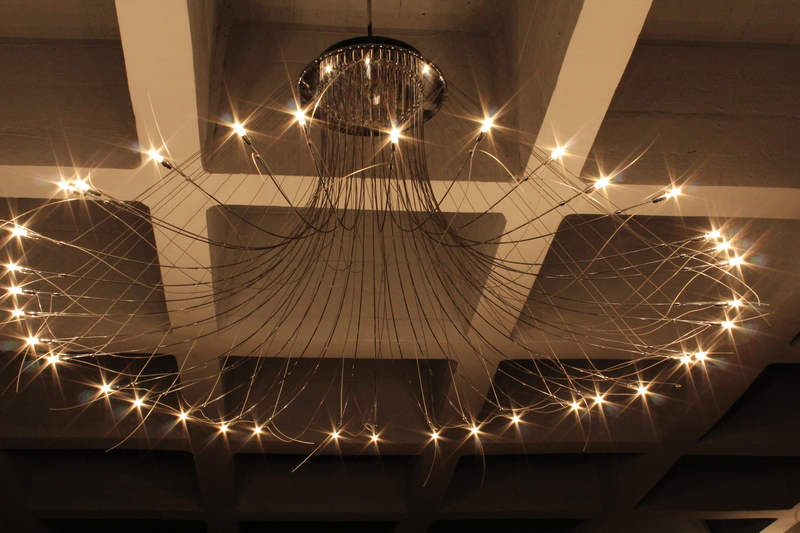 Love the light fixtures here. 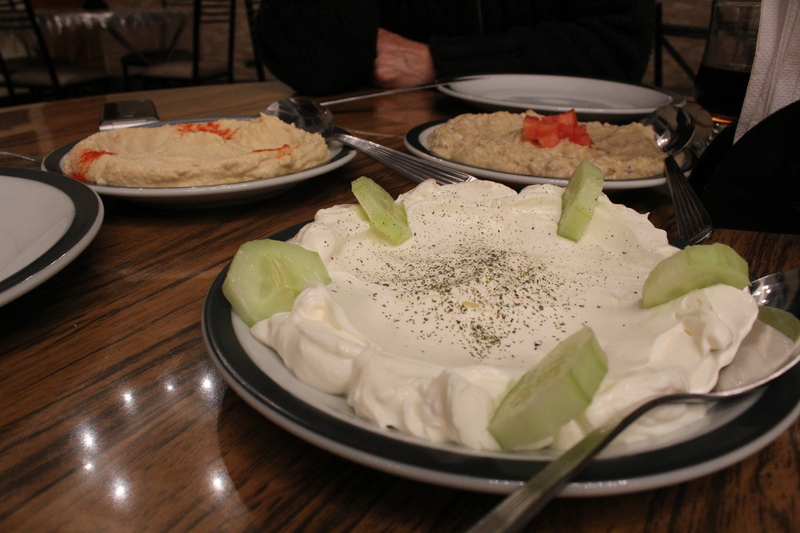 To start: a thick and tart labneh (it’s like greek yogurt), hummus, and a roasted eggplant baba ganoush-ish dish. The eggplant thing was one of the best I’ve tasted. It was so flavorful with this smokey quality to it. She said that it wasn’t baba ganoush because it was missing some key ingredient, but it tasted pretty baba ganoush-y to me. I really want to try to make it but I don’t think I’ll be able to replicate the smokey flavor. We were also able to buy some of the labneh for pretty cheap. I used it to make the pancakes for brunch the other day and we still have some left over. This is like a Syrian meatloaf sandwich. 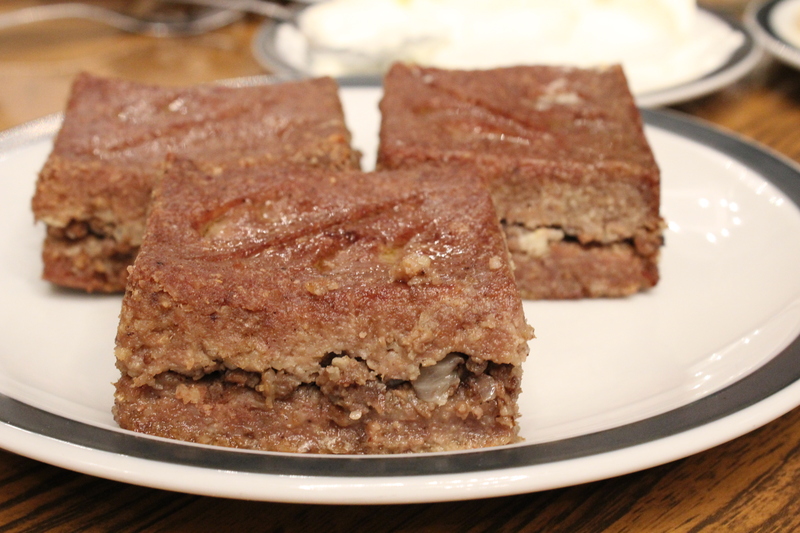 The top and bottom are a ground beef mixed with flour and spices and then in the center is more ground meat and onion and spices. It was such comfort food. 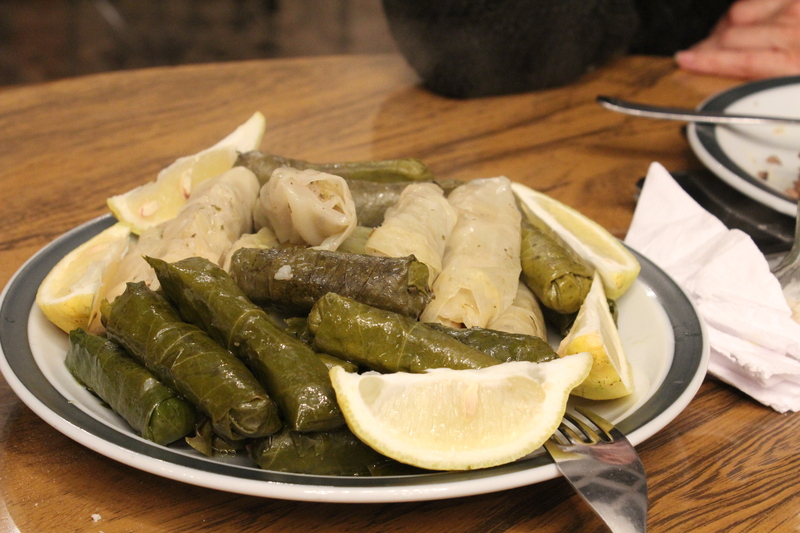 Stuffed cabbage and grape leaves. Stuffed with rice, ground meat, and spices. 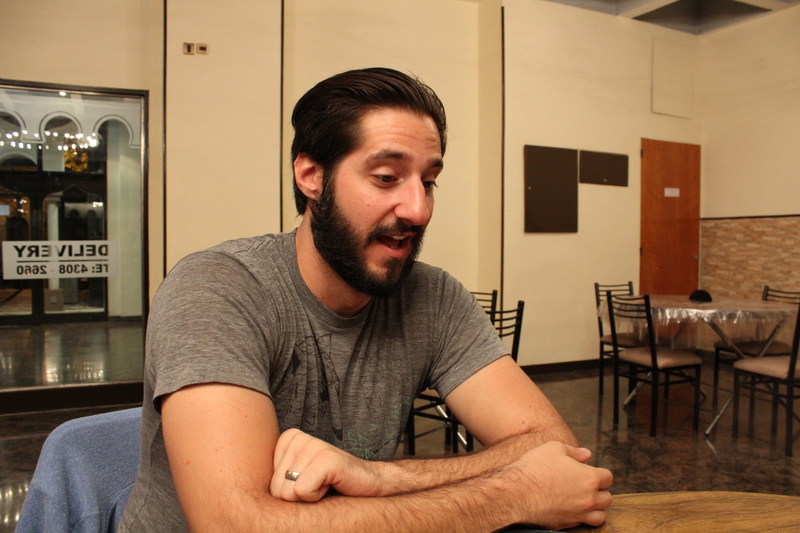 A dramatic reenactment of Jesse’s excited face when he saw the stuffed zucchini below. Isn’t he an amazing actor. 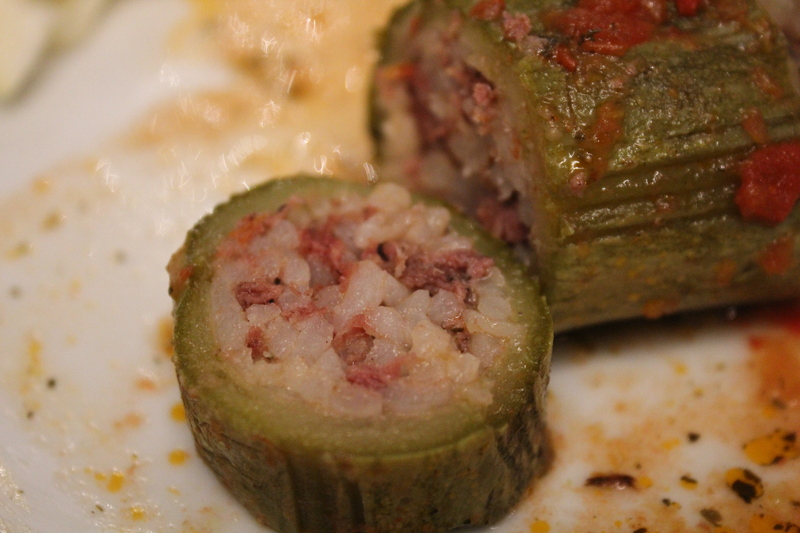 Zucchini stuffed with the same filling as the grape leaves served with a tomato broth. She even gave us these delicious baklava-ish desserts to take home and let me come back in the kitchen to snap some photos. 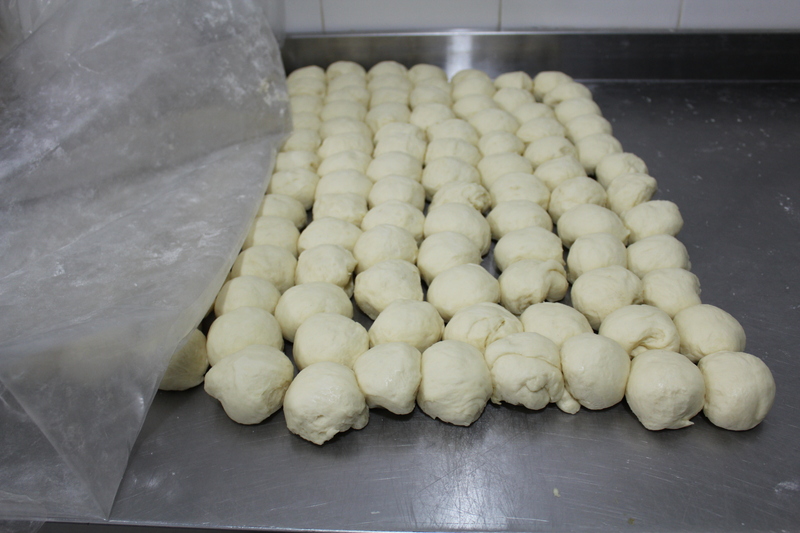 Dough resting, awaiting their empanada destiny. 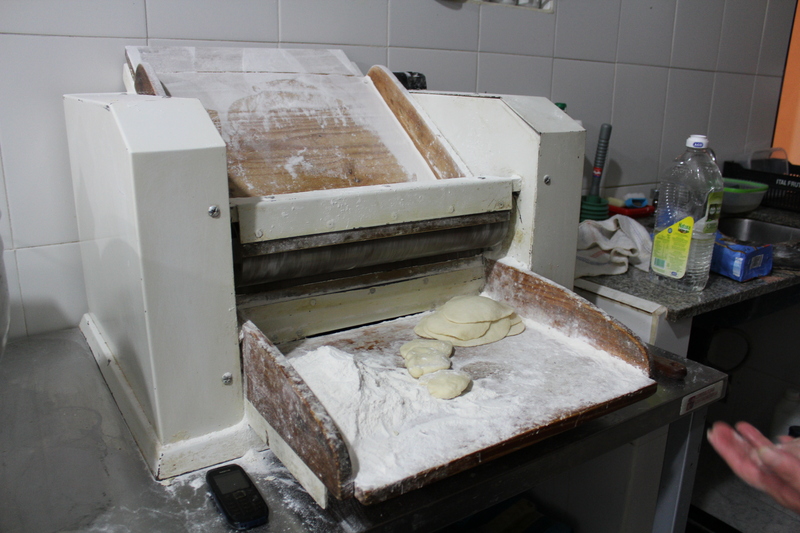 So this is how they get all those empanada doughs ready. She just flattens the balls a bit (you can see some sitting there to the left of the finished doughs) and then puts it at the top of this well-floured machine which has moving rollers. She feeds the dough through a couple times and then viola! It’s ready to be filled. 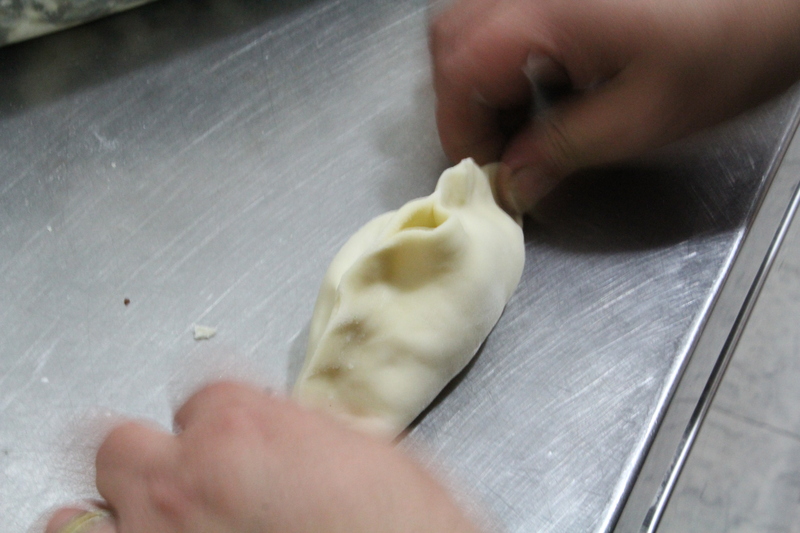 She wets the edges, fills the dough, and then forms the empanada in a blur. In the tubs you can see her pre-made fillings: carne, verduras, and queso. 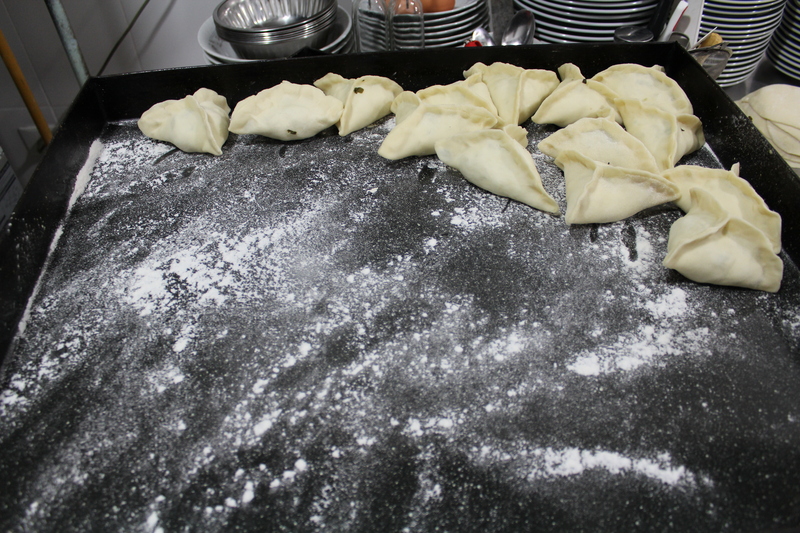 Each filling gets its own shape. She filled up this pan in the 5 minutes we were waiting there. Jesse and Gabriela hanging out watching. One of Raja’s friends from Lebanon was hanging out while we were there. He had such a thick accent I could barely understand him, but he showed me some of the posters at the back of the restaurant and told me about these cedar trees in Lebanon that have been around since 5000 B.C. He says they are so huge 8 men could wrap their arms around the trunks. 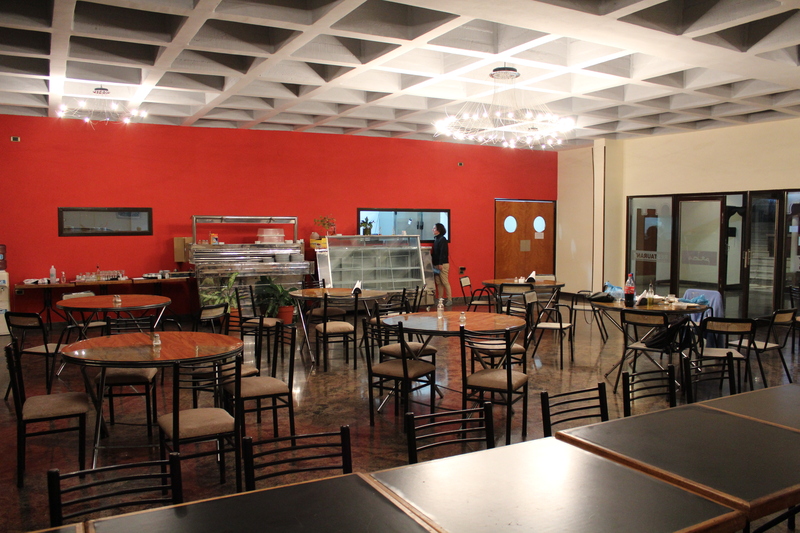 The food was so delicious and we had such a great time. I really hope we get to go back soon. Thanks to Gabriela for introducing us to it. 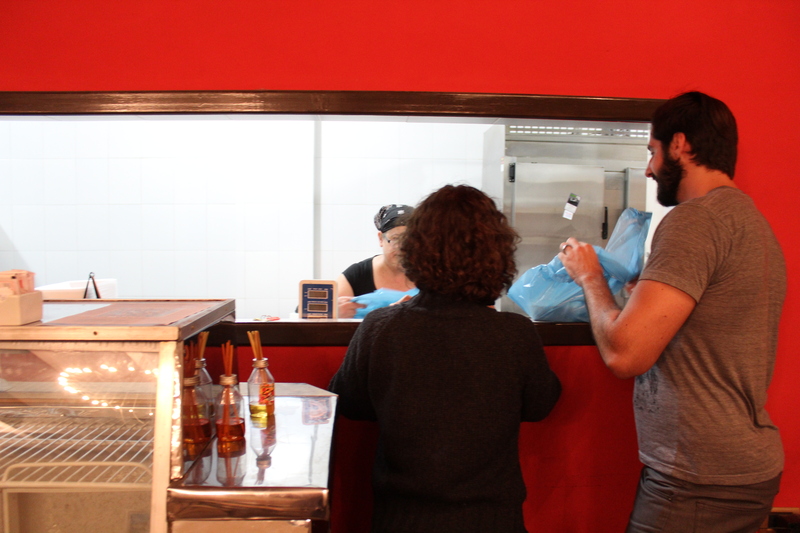 There are more non-Argentine restaurants we’re looking forward to going to – a dumpling place in Villa Crespo, a BBQ and Beer puerta cerrada in Palermo… they’re out there if you just look a little harder. Looks amazing and so much fun. I am sure Jesse was in heaven at the all you can eat/family style menu! He really was. 🙂 Honestly, I felt a little bad for the woman, but she had enough in the back and I also think she was kind of loving how excited/happy we were.